Has the Lawyer Behind Boulder Climate Lawsuit Misled the Public? Last month, three Colorado municipalities – the City and County of Boulder and the County of San Miguel – filed a lawsuit against ExxonMobil and Suncor, blaming them for the impacts of climate change. David Bookbinder, chief counsel for the Niskanen Center, a Washington D.C.-based libertarian think-tank, is representing the plaintiffs. But an investigation by Energy In Depth suggests Bookbinder may have misled the public on the nature of his involvement. While Boulder is the first lawsuit Bookbinder is transparently involved in, he has been an active voice on the climate litigation issue ever since the first cases were filed in three California municipalities last July, publishing blog posts and appearing in articles on the cases with some frequency. What is curious, however, is that in an interview with Denver-based Western Wire last month, he spoke as though he had no affiliation with, nor significant knowledge of, any of the other climate lawsuits. A quick Google search reveals that Bookbinder has been a consultant to the climate lawsuits for some time. In an article published by Western Wire earlier this month, Bookbinder is quoted as saying he couldn’t recall exactly when the Niskanen Center got involved with the Boulder lawsuit and that he didn’t “really know much more about the other cases.” But he had written a detailed blog for the Niskanen Center after San Francisco and Oakland filed their own lawsuits against fossil-fuel producers back in September 2017. In that blog he thoroughly discussed not only those two lawsuits, but also the other three that were filed by San Mateo and Marin Counties and the city of Imperial Beach back in July 2017. Indeed, his familiarity with the other cases is likely why he was asked to join the lawsuits. David Bookbinder at the “climate tutorial” for the San Francisco and Oakland cases on March 21, 2018. Even more puzzling, though, is an op-ed Bookbinder published on Vox.com last December in which he discloses he has “been consulting with lawyers working on the nuisance cases,” which he identifies elsewhere in the piece as the lawsuits filed by the California municipalities. It is hard to believe Sher Edling or Hagens Berman – the two law firms representing the municipalities in the other cases – would employ a consultant who doesn’t “really know much more about” their cases. 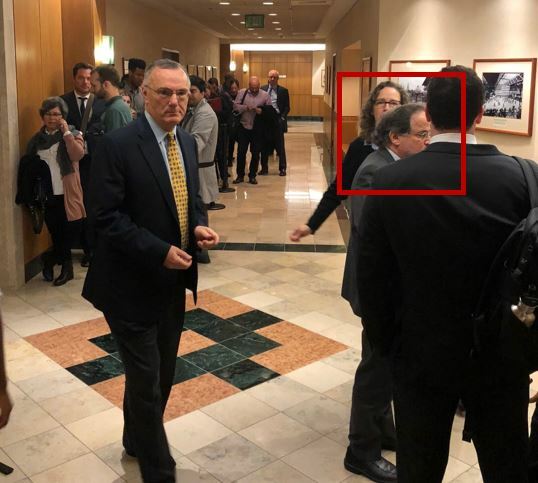 Bookbinder was also spotted at the March 21 “climate tutorial” hearing in the San Francisco and Oakland cases. His presence was confirmed by the Keeling Curve Prize, which tweeted that their “advisory council member David Bookbinder was in the courtroom” for the hearing. Presumably his clients were hoping that he might know a little more about the “other cases” after he flew across the country to spend five hours in a courtroom. Climate Lawsuit Not About Climate? But the website set up by the Colorado municipalities makes no mention of property rights (the page is titled “climate lawsuit” and the URL includes the word “climate” three times). The FAQ document provided by the municipalities never once mentions “property rights” and the only mention of “property rights” in the press release is in a quote provided by Bookbinder, while “climate” is mentioned 26 times. Weird! Nevertheless, Bookbinder and the Niskanen Center have repeatedly emphasized that the climate lawsuit is actually about property rights. This begs the question of why the municipalities and EarthRights International would bring him in as outside counsel, considering his legal expertise is largely in climate policy. For example, Bookbinder earned a name for himself as the Sierra Club’s Chief Climate Counsel. In fact, Bookbinder is one of the only people in the country to have ever held the title of “Chief Climate Counsel” for any organization. He also taught courses on “Environmental Litigation” and “Environmental Law and Science” at multiple institutions. Further, his bio for the Niskanen Center is chock-full of climate-related experience, but makes no mention of his work on property rights. Even the blog he wrote that labels the Boulder suit as a property rights issue is housed under the “Climate & Energy Policy” section of Niskanen’s website. To Bookbinder’s credit, he didn’t always focus exclusively on environmental issues. Before joining the Sierra Club, he was an attorney for Paul, Weiss, Rifkind, Wharton & Garrison where he worked on “securities, mergers and acquisitions, product liability, white-collar criminal, intellectual property and other matters,” but property rights issues do not appear to have been a major part of his portfolio. There is also evidence to suggest that Bookbinder and the Niskanen Center have been misleading when it comes to who is funding their involvement in the Boulder lawsuit. Bookbinder’s comments flew under the radar at the time, but some folks active in the climate policy discussion seem to have taken notice. In addition to working for the Niskanen Center, Bookbinder also served as a senior policy advisor at the prestigious Climate Leadership Council (CLC), an international policy organization that brings together corporations, thought leaders, and environmentalists to promote a carbon tax and dividends plan as the most effective solution to combat climate change. That could explain why Bookbinder was removed from the CLC’s website shortly after announcing his role as co-counsel in the lawsuit. A cached version of the organization’s website shows him as having been publicly affiliated with the group as recently as April 4, 2018 – just two weeks before the Colorado municipalities’ lawsuit was filed. There has been no official announcement on Bookbinder’s departure, but the timing is suspicious. It would seem that Bookbinder has tried to have it both ways on climate litigation for years. He has called it the “worst way to do policy” and in the same article admitted to consulting on climate lawsuits. He has endorsed and possibly co-written a carbon tax plan that would protect companies from climate lawsuits and then joined a set of climate lawsuits roughly a year later, though he has insisted his involvement is limited to a focus on property rights. Only one thing can be said for sure – David Bookbinder has some explaining to do.